There is no doorway for us to walk through in this post, but the San Pedro Springs and surrounding area has more history than can be recounted in just a few words. In researching the Park I have collected enough data to write a book. I have found myself reading through archeological abstracts and other surveys, spellbound by the findings. Needless to say, I have struggled with writing this post because there is so much to share, so I'm going to offer just a few facts and pictures for now. This area just northwest of downtown San Antonio has been a gathering place for humans for thousands of years. Prehistoric artifacts including bones, projectile points, and stone tools have been found during archeological investigations. 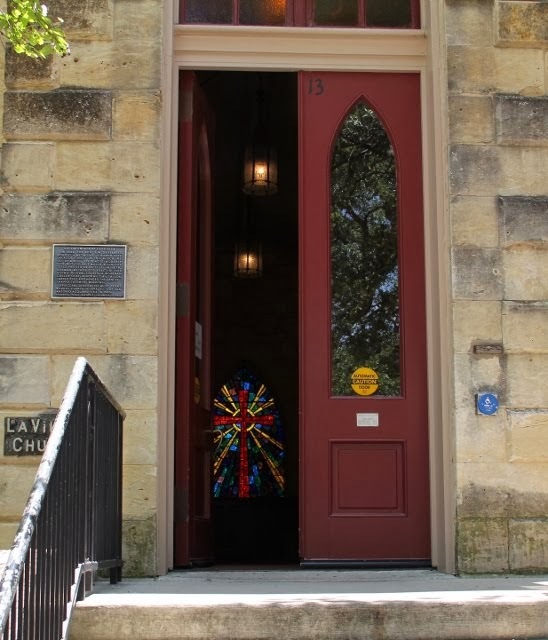 In 1709 a group of Franciscan priests led by Fathers Antonio de San Buenaventura de Olivares and Isidro Felix de Espinosa came through this area on an expedition to the missions of East Texas. They found a band of native Coahuiltecan Indians who called themselves the Payayas living here in their village, Yanaguana. Father Espinosa named the springs agua de San Pedro. 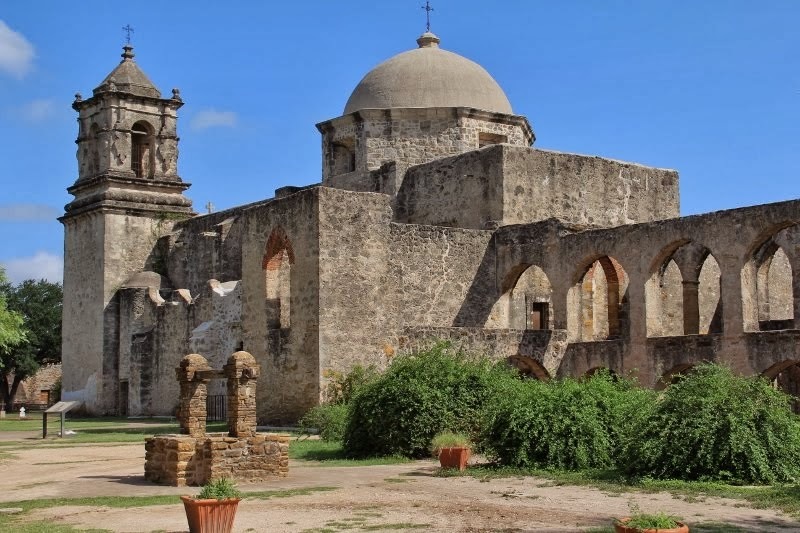 Father Olivares felt this would make an excellent place for a mission settlement and would return in 1718 to establish the mission San Antonio de Valero. Its location is believed to have been somewhere in close proximity to the San Pedro Springs (this mission would move several times and its final location would become famous as the site of the Battle of the Alamo). Early explorers would often confuse these springs with the nearby springs that create the headwaters of the San Antonio River. The abundant supply of water from both springs was diverted to mission farmlands through a system of acequias built by Old World craftsmen who were skilled in designing and building perfectly functioning waterways that used a gravitational flow system. This acequia is what remains of the Alazan Ditch, an ill-fated concrete project engineered by Anglo businessmen in City Hall in 1874. It never functioned correctly and it was later reported that the City Engineer had "discovered that water will not run uphill" (San Antonio Express, April 16, 1875). King Phillip V of Spain declared the area around San Pedro Springs an ejido (public land) in 1729. When the Canary Islanders arrived in 1731 they were given temporary use of the land for farming. It would be used by the military for encampments as well as civilians for public gatherings. A plaque in the park declares that this is the second oldest public land in the United States; however, I read in several places that it is actually one of the top 10 oldest. Records of the original boundaries were lost during the turbulent years of the early 1800's. In 1851 the City re-established the boundaries based on the memories of older residents. The bandstand was built around 1890 over a pit that had housed bears. Hot air balloon rides were offered and daredevil parachutists offered entertainment. Shooting matches and horse races also took place in the Park. In 1864 the Park as we know it began to be organized. Jacob J. Duerler received a 20-year lease on the property from the City in return for his management. He built fences, added landscaping, and cleaned out the Springs. Fish ponds, rental boats, and a building with a ballroom and bar enhanced the property. It became so popular that a mule-drawn cart began making continuous runs between the park and downtown. The pool is the centerpiece of the park today. Originally there was a small lake created by the flow of the springs. Following numerous renovations the City opened the first municipal swimming pool in 1922 using the old lake bed as a base. The lake was naturalistic and still replenished by the springs. Progress wasn't kind. The drilling of artesian wells eventually dried up the springs and in 1940 the pool was closed. In 1954 a new, modern cement pool was built, complete with chain link fencing; a new tennis facility was also constructed. That pool was eventually closed and sat empty until the City undertook an extensive restoration project for the park that included this pool that closely resembles the 1922 version. It is used as a City pool during the summer months, and is considered a lake during the remainder of the year (of course, there are those that swim in it off season!). It is not filled with spring water, but with municipal water. In the swimming season it is surrounded by a wrought iron fence to prevent entry except through the bath house (on the right in the above picture). Old photos show that this star shaped structure was originally topped with ....a cow's head that appeared to be made of stone. A close up of one of the main springs. The last time the springs were active was in 1992. IF we ever have a substantial rain again you can be sure that I will be here to check on these springs! There are many very large trees in the Park. These cypress trees along the side of the pool are quite large, but there are several oaks that have a tremendous base and wide, spreading branches. Obviously, they have all witnessed many years of the history of this enchanting ejido. San Pedro Springs Park was entered in the National Register of Historic Places in 1979.